4. A link to source is required when submitting. Source and any assets created for the game has to be release into Public Domain or under permissive license unless they're a derivative work of someone else's work, which can't be released so. 25. Voting takes place is several categories, that will be known to voters on the beginning of the voting phase. It's just a proposal, feel free to comment and propose changes to it. Now for something completely different, as we're already past GGJ and LD is closer every day, let's talk terms. As next LD is going to happen on 15 Apr - 18 Apr with their theme voting happening some time before that, I'm inclined to prefer option 2) giving us all a bit more time to prepare (and relax after GGJ) and keeping reasonable time delay between the end of SFML Game Jam and beginning of next LD. tl;dr; rule proposal in line with my previous posts modified as requested by giving everyone 2 weeks + extra weekend to work on their game. 1 extra brainstorming day, 2 extra packaging days. I propose for the next SFML Game Jam to take place from 27. February to 13. March with other activities taking place right before and after those days, as listed in item 2) of table just a bit up. Comments welcome. What's the aim of this rule? What if I vote for X themes that I like, but then see another theme I like more than the others? surely one vote per theme per participant makes more sense? Especially as you're having up/down votes? Other than that, I like the change to 16 days, as others have said this might actually mean I can get involved! Ask zsbzsb about that one. I would do it just like you say, but this is how it's implemented right now and zsbzsb seems to prefer that way because "you have to focus on what you really care about". EDIT: On a side note, it's possible to set some insanely high number, so you have enough votes for everything. Sounds good. It's pretty inspiring to have such enthusiasm and effort going into the organisation. I'm not sure about the time-frame though as you can't focus every hour of every day for over 2 weeks. It can be possible for 2 or 3 days. This might very well lead to some people spending approximately the same time they would spend on the 3 day jam spread out over the 2 weeks, possibly less focus and motivation. Please don't misunderstand me; I do think this time-frame is worth trying. It's not about creating the most awesome games ever invented but it is about lots of people being able to participate. I think this time frame will help a lot for that. surely one vote per theme per participant makes more sense? Especially as you're having up/down votes? Only having up/down votes is a good reason to not vote all of the themes. Consider it a vote of three states, not two: negative, neutral, positive. What if I vote for X themes that I like, but then see another theme I like more than the others? This, however, is possible. 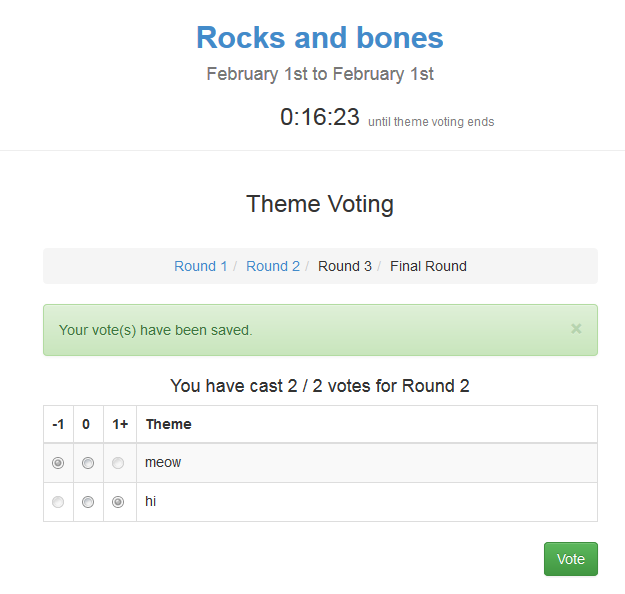 You can change which themes you have voted for to the ones you are more passionate about. e.g. You found a theme you like more, "un-vote" one that you care less about and then vote for the newly found favourite. I may be mistaken about the voting. I seem to remember the ability to remove a vote but I may have dreamed that. The only thing to 'worry' about is the people who decide to work on theirs solidly for the entire 16 days. Poor souls. Firstly, I would also be up for a new jam and will participate, subject to it not conflicting with anything else on. Secondly, I am also in favour of everyone publishing their code, to serve as practical examples of game development with SFML. On the other hand, don't let this become another license debate; don't try to tell me whether I should copyleft it or not. Over a weekend, over two weeks, either way count me in! How do I get notified of new posts to this thread? I guess this reply will do. Can't wait! Unless you're away for two weeks, that shouldn't be a problem! As far as I'm aware, this has always been in the rules. Over a weekend, over two weeks, either way count me in! It's actually 16 days, which is three weekends! I took the liberty to clarify it a bit while ensuring maximal usefulness, as code that's just posted somewhere without any license is as good as none, as no one can reuse it for anything (no rights given). We can probably go with some compromise allowing copyleft while recommending permissive for anyone without a reason to go copyleft, or we can even recommend one specific license for people that doesn't want to dig in the legalese at all. (Probably CC0, as it can be used for both code and assets, or some combo like zlib & CC-BY, even though it makes things more complicated for everyone.) Downside it, people still couldn't re-license any third party stuff, so they would still need to at least list it with authors and licenses. EDIT: Should anyone have opposite problem (wouldn't like to provide sources at all), well, this jam is organized by SFML community and the community wants to get something back. The open source rule has been there before and is about to stay, unless there're some very good arguments against it. Open sourcing is also quite common practice in jam world (though not all jams set it by rules). This is more or less correct. You can of course get in touch with the author, and they can license it appropriately for you. As I don't gather from your last post, do you (or anyone) has any serious objection about the current license ruling? Or can we proceed? Any comments on the proposed term?